Arianespace’s third mission of 2016 – and the first this year with its Soyuz launcher – is a “go” for liftoff from the Spaceport in French Guiana on Friday evening to deploy a five-satellite European payload. The “green light” was given today following the Launch Readiness Review, which validates the status of this mission’s launch vehicle, its passengers, the launch site infrastructure and the tracking station network. During preparations leading to today’s go-ahead for Flight VS14, the logos for this mission’s satellite passengers were installed on the Soyuz payload fairing (at left). In the photo at right, the completed “upper composite” – with the five satellite passengers and Fregat upper stage encapsulated inside the payload fairing – is installed atop Soyuz inside its mobile gantry at the Spaceport. 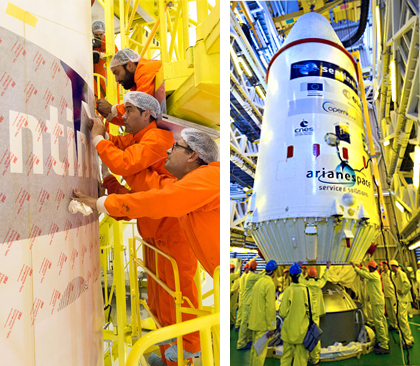 Liftoff is set for April 22 at a precise moment: 06:02:13 p.m., local time in French Guiana. Designated Flight VS14 in Arianespace’s launcher family numbering system, the medium-lift Soyuz carries a mixed payload of the Sentinel-1B C-band radar observation platform, a trio of “Fly Your Satellite!” technology demonstrator CubeSats, and the Microscope scientific satellite. To deploy these passengers, four burns will be performed by Soyuz’ Fregat upper stage, releasing the payloads in low Earth orbits at three different altitudes. Flight VS14 will have a nominal duration of 4 hours, 52 seconds from liftoff to separation of the final satellite passenger. Sentinel-1B will be separated first from the Fregat upper stage, placing it at a planned altitude of 686 km. with an inclination of 98.18 degrees. 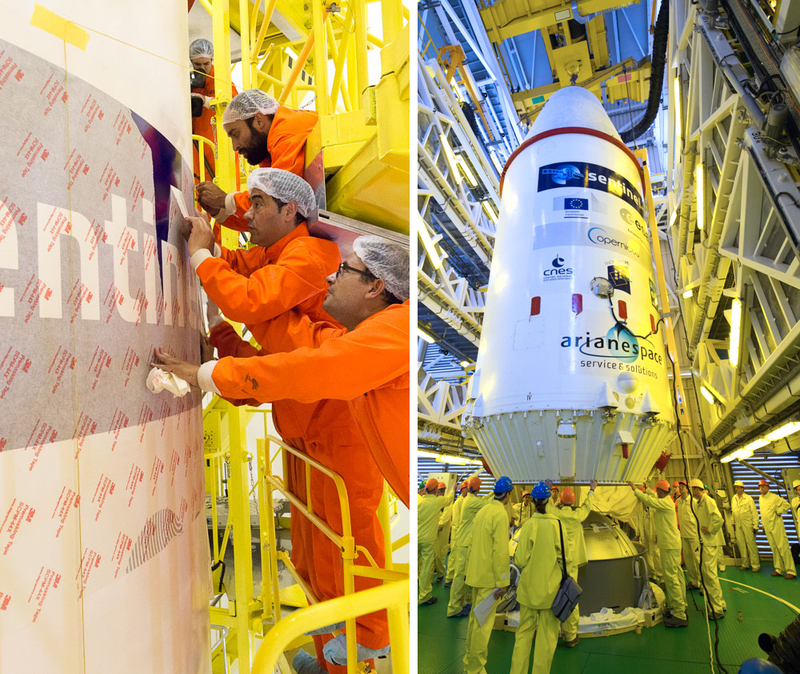 With a liftoff mass of 2,164 kg., this Thales Alenia Space-built platform will join the space segment of Copernicus – the European Commission’s program with the European Space Agency (ESA). Sentinel-1B is designed to provide a comprehensive solution for radar surveillance of the environment and for security issues. The three “Fly Your Satellite!” CubeSats are to be released in the mission’s second deployment phase, with a perigee of 453 km. and an apogee of 665 km. Fly Your Satellite! is an ESA initiative to offer European university students practical experience in key phases of a challenging, real satellite project. Weighing 1 kg. each, the Fly Your Satellite! CubeSats are: OUTFI-1, from the University of Liège in Belgium, to demonstrate the D-STAR communications protocol; e-st@r-II, supplied by the Polytechnic institute in Turin, Italy as a demonstrator for a 3-axis attitude control system using the Earth’s magnetic field; and AAUSAT-4 from the University of Aalborg, Denmark, serving as demonstrator for the reception of signals from an Automatic Identification System (AIS), designed to identify and locate ships sailing offshore in coastal regions. Flight VS14’s final step will be the deployment of Microscope (the French acronym for: MICROSatellite à trainée Compensée pour l‘Observation du Principe d‘Equivalence), which was built by the CNES French space agency with assistance from ESA and other partners. The 303-kg. Microscope spacecraft will be deployed at an altitude of 711 km. with an inclination of 98.23 degrees, and is to test the equivalence principle described by Albert Einstein.